For our customers who have not been here in recent months or those who are not yet familiar with the latest changes, from the last weekend travellers can drive in and out of the airport facilities by the so-called Southern Access which directly links with the A-7 / MA-20. With this second access to the airport – which so far had only one access which had to put up with a high volume of traffic – is expected to quite decongest Garcia Morato Avenue where Malagacar.com is located. However, since we’ve made this video in June last year, the signposts have changed once again and we have received responses from some customers confused by the signage. To facilitate the issue: Stay with the number of the road: The MA-21 Avenida de Velazquez is the former airport access. By the MA-20 you will enter the airport by new Southern Access. • Of course, the new access is pleasant to drive, very urban and in accordance with the design of the new airport. • In kilometres, it is slightly longer and adds a few extra minutes of travel for Malagacar.com customers who wish to return their vehicle. • It is perfect if you only want to pick up or drop off a friend or relative. So we recommend our customers who wish to return their vehicle to get to the Airport by the old MA-21 (Avenida de Velazquez). Thanks to all our customers who so actively discussed on Facebook! I am confused as to how to find your rental offices and had a problem finding my way last time I hired a car from you. Could you please tell me how to find you when I am coming from Nerja. If you can tell me which road signs and directions to follow I would be really grateful. In a previous response to a client you can also see a photo of this exit to the airport. Vanaf Torrox Costa blijft het hetzelfde. Ofwel rijd je richting Torremolinos en neemt dan de afslag rechts naar de luchthaven, ofwel neem je direct de richting luchthaven terwijl je rond Malaga stad aan het rijden bent. Het zal er alllemaal wat nieuw uitzien voor je, maar de route blijft hetzelfde. Bedankt voor je bezoek! Maybe this capture is helpful to visualize the area and the basic changes. 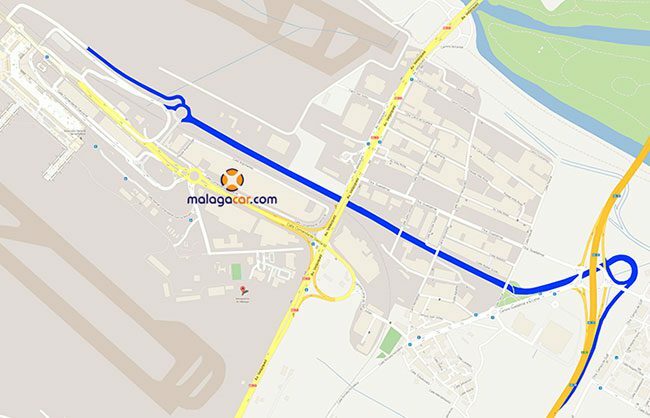 As you can see, Malagacar.com is situated between the MA-21 Avenida de Velazquez and the airport. In this section there haven´t been any changes, i.e. you can drive on to the A-7 from our offices like always. Yet the access to the airport from Avenida Garcia Morato has changed; after the large roundabout at the entrance of the airport now you can’t´ drive straight to departures any more but are obliged to turn right into the new southern access road and do a little extra detour. the exits going to Malagacar from Cadiz motorway is very confusing. We have just come back from Malaga and missed the turnoff – as usual the signs for the airport disappear and leave you unsure of where to exit. We went on to the next exit and had to turn back on ourselves, but signs are not clear. i have to say I do not find the map on this site very informative. I have been there and still do not know what you mean by your directions. Be advised – leave lots of extra time in case you get lost!!!!! We are sorry you don´t find our indications informative. 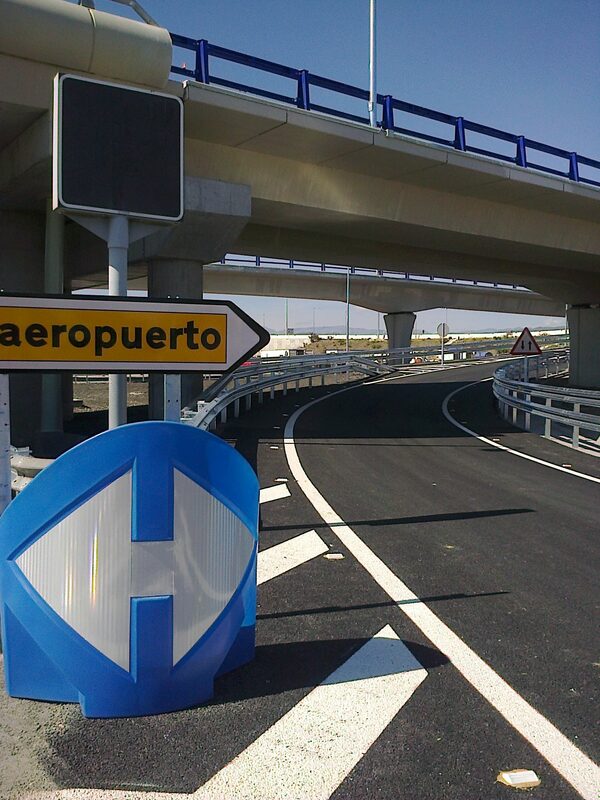 Driving on the Motorway, you have the option of Exiting to the airport on the MA-21 Avenida de Velazquez, which is the former airport access, or by the MA-20 you will enter the airport by the new Southern Access. It is true that signposts have been changed, basically to “redirect” everybody along the new access road. 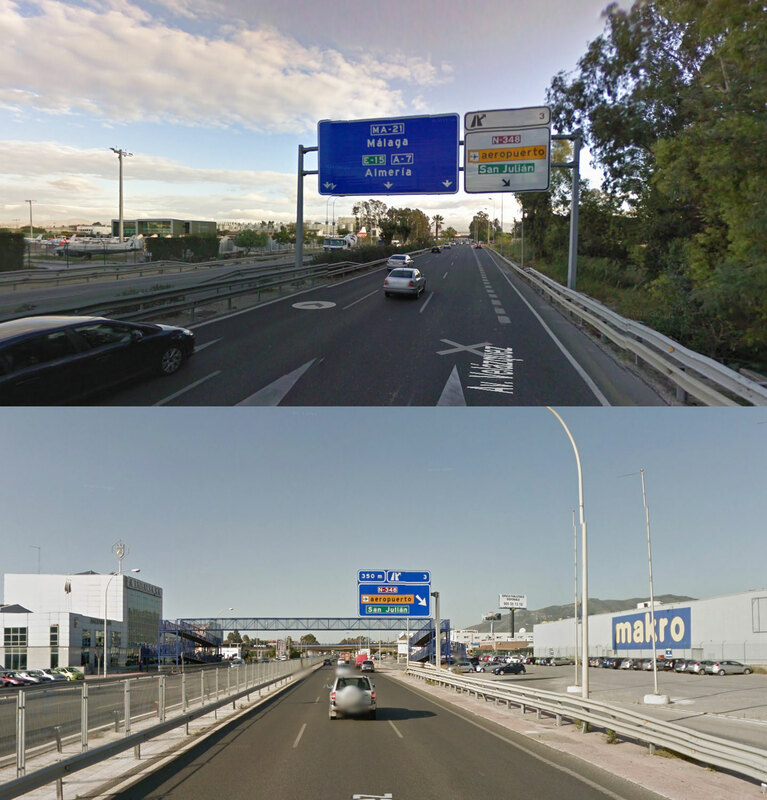 Thus we attach as well a couple of Street View Captures of the old access (EXIT NO 3 SAN JULIAN AEROPUERTO), coming from the Western Costa del Sol (picture 1) and Malaga / Eastern Costa del Sol (picture 2). Nevertheless, it is advisable to travel always with some extra time as there can happen drawbacks or delays. Many thanks for excellent services during my recent trip to Malaga!